Diatoms are single celled planktonic algae with external skeleton made of silica. Viewed under microscopes, diatoms show a huge variety of shapes with many interesting and beautiful patterns. They can appear as filaments, chains, or colonies, either in the water column (phytoplankton) or attached to any single substratum (benthos), and they are the among the most numerous algae, particularly the Southern Ocean around Antarctica, and also in sea ice. 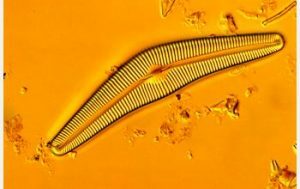 Diatoms are thus a major food resource for marine and freshwater microorganisms and animal larvae. and the Pennales (now called Bacillariales) which have valve striae arranged in relation to a line and tend to appear bilaterally symmetrical. They appeared millions of years ago, along with dinosaurs. They’re involved in the biogeochemical cycling of silica and are virtually inherent in every environment ranging from water to ice to soil. The silica shells are left behind when a diatom dies, forming diatomaceous earth. Diatoms are “champions of photosynthesis” produce 25-40% of the oxygene we breathe. Photo: Diatom species Cymbella cistulaMark B. Edlund, Ph.D.